Manage reservations and tables at one or more restaurants from any computer, tablet or smartphone. Tailor the run sheet, floorplan and timeline views to suit your set-up, and make sure your venue is always running at full capacity. Never lose a reservation again. Turn cancellations into opportunities by allowing guests to add themselves to your waiting list online. No tables free for a walk-in guest? 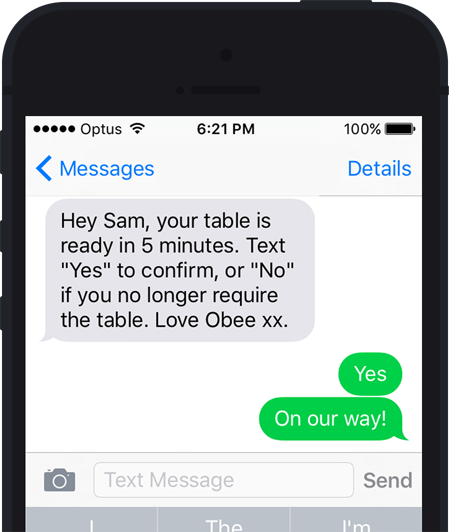 Keep your venue buzzing by sending walk-in guests a custom text message when their table is ready. Automatically confirm reservations, email or text guests reminders, and offer alternate times to fill reservation gaps. All from your website. 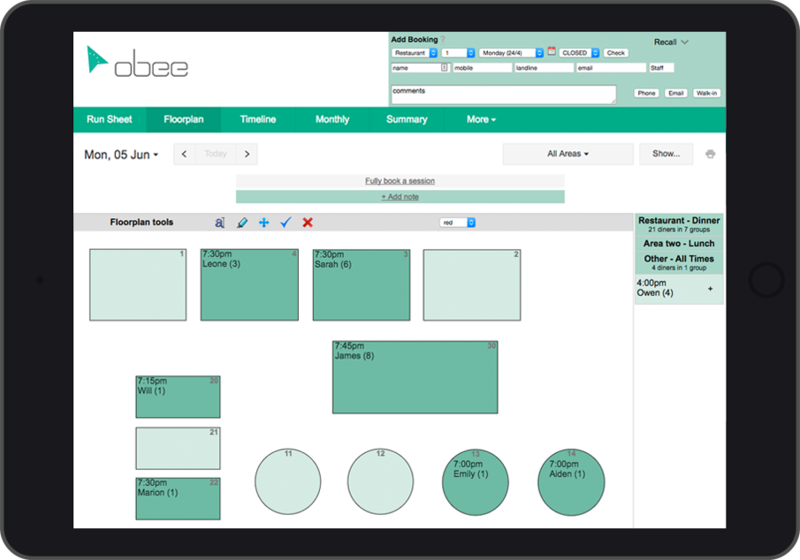 Obee can customise your booking widget to match your website’s design for a seamless customer experience. Obee can help grow your email and SMS lists through MailChimp, Campaign Monitor and MyGuestlist integrations. We’ve partnered with Broadsheet too, enabling you to make your Broadsheet listing bookable to its 2.5 million monthly visitors. Used by some of Australia’s best. Availability of Obee features varies by country. A service fee of 0.8% applies to all transactions. Transactions are also subject to fees charged by Pin Payments. Try Obee. Free for 30 days.